Adidas, the official oncourt apparel provider for the National Basketball Association (NBA), today unveiled the uniforms and apparel for the 62nd NBA All-Star Game on February 17, 2013 at the Toyota Center in Houston, TX . Designed by adidas, the uniforms take inspiration from Houston's rich aeronautical history and the speed of the jet planes that dot its skies. The uniforms' eye-catching impact camo pattern evokes the world's fastest fleet of aircraft with the classic silhouette of a basketball net. "The NBA All-Star Game is an exciting time to unite adidas' line of performance and style products to celebrate the court-to-street style that runs through basketball culture around the world," said Lawrence Norman, adidas Vice President, Global Basketball. "2013 marks adidas' sixth season designing NBA All-Star uniforms and every year we look forward to introducing performance innovations that help the best basketball players in the world lift off and take their games to the next level in front of a global audience." 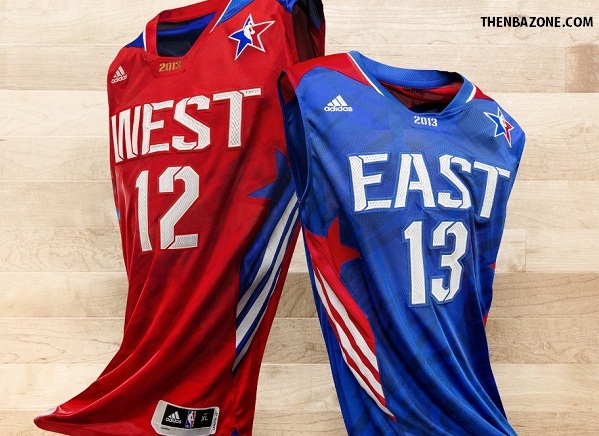 The adidas 2013 NBA All-Star uniforms feature specially-engineered mesh to provide maximum mobility and breathability. The West (red) and East (royal blue) uniforms also feature the adidas iconic three-stripe design flanking the side of both the jersey and shorts. The uniform lettering and numbers are inspired by the stenciled style on jet planes. 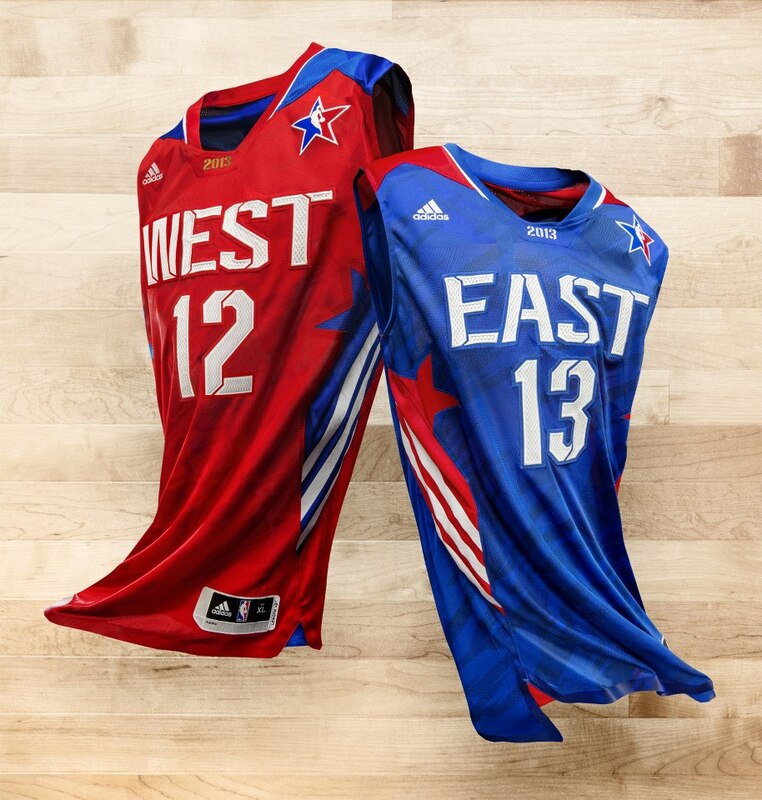 Replica 2013 NBA All-Star jerseys will be available at NBAStore.com with a full range of NBA All-Star apparel from adidas including men's and women's T-shirts, track jackets and headwear. adidas has been providing innovative products for the world's best athletes for more than 50 years, from past legends to today's superstars, such as Dwight Howard, Derrick Rose, Candace Parker and Tim Duncan. On April 11, 2006 adidas and the National Basketball Association signed an 11-year global merchandising partnership making the adidas brand the official uniform and apparel provider for the NBA, the Women's National Basketball Association (WNBA) and the NBA Development League (D-League) beginning with the 2006-07 NBA season. NBA All-Star 2013 in Houston will bring together some of the most talented and passionate players in the league's history for a global celebration of the game. The 62nd NBA All-Star Game, which will take place on Sunday, Feb. 17 at Toyota Center, will reach fans in more than 200 countries and territories in more than 40 languages. TNT will televise the All-Star Game for an 11th consecutive year, marking Turner Sports' 29th year of All-Star coverage. State Farm All-Star Saturday Night will feature Sears Shooting Stars, Taco Bell Skills Challenge, Foot Locker Three-Point Contest, and Sprite Slam Dunk. Other events at NBA All-Star 2013 will include the BBVA Rising Stars Challenge, NBA Development League All-Star Game, Sprint NBA All-Star Celebrity Game, and NBA All-Star Jam Session. Houston also hosted NBA All-Star in 2006 and 1989.